After a long day from work, this anonymous note on my door surprised me. I was speechless for a minute or two. Not again, I thought. Why on earth I have overly sensitive neighbors and all the sounds coming from my room were closely monitored? Since that complaint I received last March, I have been very cautious not to disturb my neighbors again. From that time one, even how inconvenient it is, I use earphones while using my PC or listening to music, especially at night. And for the record I am not even watching television since most of the times I cannot understand Japanese shows. Though at certain times, I listen to my ipod without earphones but it is on a very minimum level. And I cannot imagine how that sound would actually bother them. And I don’t sing along. The vibration of the A/C or of the exhaust, even the water from the faucet is way louder that the ipod’s volume. Perhaps, maybe because I am a foreigner and they can easily assume that I am the source of that noise. Or maybe because of what had happened before, making me an automatic suspect. That note (though maybe be written nicely and in English) really left me wondering. This is an apartment, and not an asylum or any music-restricted place, if there’s any. I wrote a reply on that note but decided not to post it to avoid further misunderstanding. Literally, I am living in silence at night. If only my neighbors knew how I understand their situation when they wash their clothes in the middle of the night. Or when their dogs bark in the middle of the night. Or when they listen to some Japanese shows and get excited late at night. Or when their kids start running around in the wee hours. I did not complain to the building administration or our company’s admin thinking that these are inevitable and they have all the right for it. And I respect that. But here they are complaining right away to the littlest sound coming from my room. We all have cultural differences and as much as possible we should respect and understand one another as long as it doesn’t spell abuse. I already informed our company’s administration in order to help me with this one. They told me that if I continue to feel uncomfortable, I can move to other apartment. But what if I’ll have the same kind of neighbors again? Same old story. For the meantime, I decided to stay in my present apartment and will be more extra cautious not to upset them again (but I didn’t do anything). 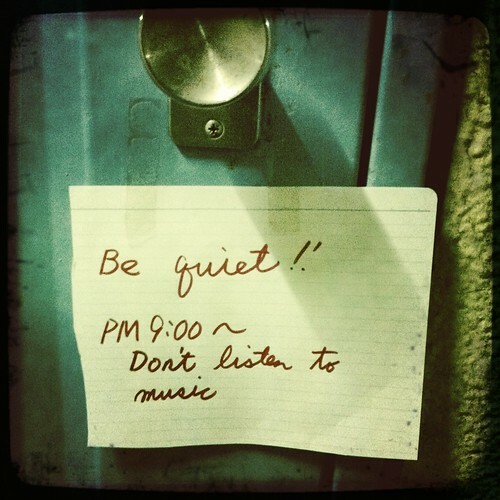 I am afraid though that next time someone will post a note outside my door that I cannot walk around my room after 9 pm. That will be a different story. Ooh, how aggravating. I remember that kind of neighbour, too well - a family of parents + 10 offspring squatting in the flat below ours after they'd burnt their house down for the insurance money, which they used to buy radio, TV, hi-fi and electronic keyboard with drum kit. Neighbours who needs them, that is what I say. I hope your situation improves it sounds dreadful! It is sad when respect and understanding is one sided maybe things will get better! best of luck! Tall fences make good neighbours. Having neighbours put us in a quandry. Some are just obnoxious by nature. Given half a chance they'll react nastily. Just like defensive driving, we avoid antagonizing them. You did very well under the circumstances. Very good story. Isn't it funny how people are the same the world over? That is amazing! You are so patient! Take some manju, meet your neighbour/s, and maybe you will make some friends for life.